The Darwin Railway Station is located some 10 k's from Darwin City close to the new East Arm Port facility at the end of Berrimah Road. This passenger terminal is only used by the Adelaide - Darwin train known as The Ghan for it's twice weekly service. It is a bit different from most Australian railway stations, with no raised platform. There is an airconditioned waiting room, a baggage check-in and a ticket office along with some shaded seats for waiting passengers. For Red Service passengers, a bus service provides a direct link from the Transit Centre in Mitchell St, Darwin to the train passenger terminal specially for each train service. Passengers using the Platinum and Gold train services are collected directly from city hotels by bus - if your hotel is on the bus round. The buses only pick up from certain hotels, people staying at other hotels need to get to the nearest pick-up point. Phone 132147 #3 to clarify your pick up options if you are on a Gold or Platinum Ticket. The train is quite long, with 25 carriages and extra freight cars. The same buses which brought passengers from the city are then used to ferry Gold or Platinum service guests to their individual train carriages, saving a long walk in the hot sun. 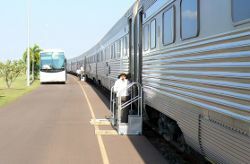 Passengers photograph the Ghan at the Darwin passeger terminal. Click here to return from Darwin Railway Station to Enjoy Darwin home page.